Black cats, witches, skeletons, owls. Sure, when we hear there references we think of Halloween. 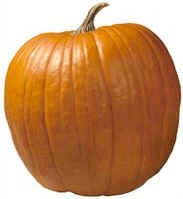 But they are no match to the Jack-O-Lantern as the symbol of Halloween. It's such a given ritual every Halloween season to pick up the best pumpkin and carve him up that we often take the orange guy for granted on Halloween. So why, oh WHY, did a carved gourd ever become associated with Halloween anyhow? According to legend and lore, Jack was a legendary, stingy drunkard. He tricked the Devil into climbing an apple tree to get him a juicy apple and then quickly cut the sign of the cross into the tree trunk, preventing the Devil from coming down. Jack made the Devil swear that he wouldn't come after his soul in any way. The Devil promised. However, this did not prevent Jack from dying - on All Hallow's Eve. When he arrived at the gates of heaven, he was turned away because he was a stingy, mean drunk. Desperate for a resting place, he had the nerve to go to the Devil. The Devil, true to his word, turned him away. "But where can I go?" pleaded Jack. "Back where you come from," spoke the Devil. The night was dark and the way was long, and the Devil tossed him a lighted coal from the fire of Hell. Jack, who was eating a turnip at the time, placed the coal inside and used it to light his way. Since that day, he has traveled the world over with his Jack-O'-Lantern in search of a place to rest. Irish children carved out turnips and potatoes to light the night on Halloween. However, when the Irish came to America in great numbers in the 1840s, they found that a pumpkin made an even better lantern, and so this "American" tradition was born. Sweet Linus of Peanuts is somewhat delusional - waiting for a Santa-esque figure in the form of a pumpkin that will rise out of the pumpkin patch that he finds to be most sincere. Linus shouts "Look around you! Nothing but sincerity as far as the eye can see!" Then, according to Linus, The Great Pumpkin flies through the air to deliver toys to all the good little children in the world. 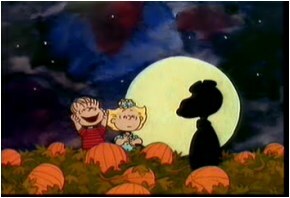 Alas, The Great Pumpkin never shows up, but that doesn't deter Linus' faith in The Great Pumpkin - because he will, of course, show up next year! Debuted in 1966, The Great Pumpkin never gets old. In order to take Cinderella to the ball, her fairy godmother, a very resourceful fairy godmother looks at a pumpkin and sees it potential in becoming an elegant carriage to whisk Cinderella away. The Cinderella we know - Disney's Cinderella was based on the French version of the tale as recounted by Charles Perrault in Histoires ou Contes du Temps Passé. The classic story has been made into countless versions, from Cinderlad to The Golden Slipper - a Vietnamese take on the story to Sidney Rella and the Glass Sneaker. We are not sure if the pumpkin endures is involved in each version! The Headless Horseman is a ghost, with a temporary head in the shape of a pumpkin based on Washington Irving's Legend of Sleepy Hollow. The story explains that the Headless Horseman was a German fighting with the British in the Revolutionary War, who lost his head from a canon ball firing. Poor Ichabod Crane is the hapless victim, who did not heed the warning that a headless ghost was out there looking for a new head. Some believe that the Horseman is actually Brom Bones - a rival of Ichabod's for the lovely Katrina - in guise as the legendary ghost. 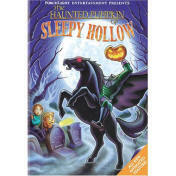 The tale of the Headless Horseman has been recreated countless of times in movies and cartoons. From Disney's The Adventures of Ichabod Crane and Mr.Toad to Tim Burton's Sleepy Hollow to Scooby Doo.